VERY IMPORTANT - A CURRENT PHONE NUMBER MUST BE PROVIDED AT TIME OF ORDER SO WE MAY CALL AND ARRANGE YOUR DELIVERY APPOINTMENT. WE CANNOT SHIP WITHOUT A PHONE NUMBER. This beautiful Twin Captains Bed Bookcase with 3 Drawer and Trundle, Desk, Hutch, Chair and 5 Drawer Chest in Merlot Finish is the best choice for your bedroom. 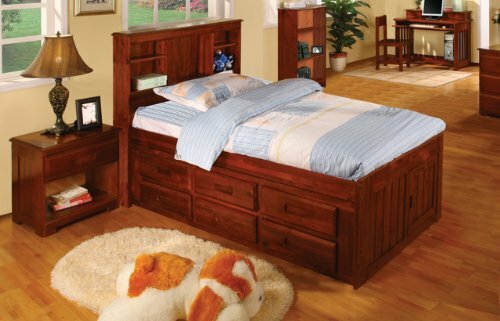 This delightful bed set is made of a Solid Wood Construction made to last for years to come. This bed set is Mattress Ready and European Roller Glide Drawers. Footboard Storage Door Reversible.